Danganronpa V3, like previous entries in the excellent humor-horror series, is full of pop culture references. But how did an NFL joke get stuck in there? As a longtime New York Jets fan who has nothing but bile for the New England Patriots, I very much enjoyed seeing the above line, a non sequitur delivered by one of the game’s irritatingly charming Monokubs. Clearly GOTY material. 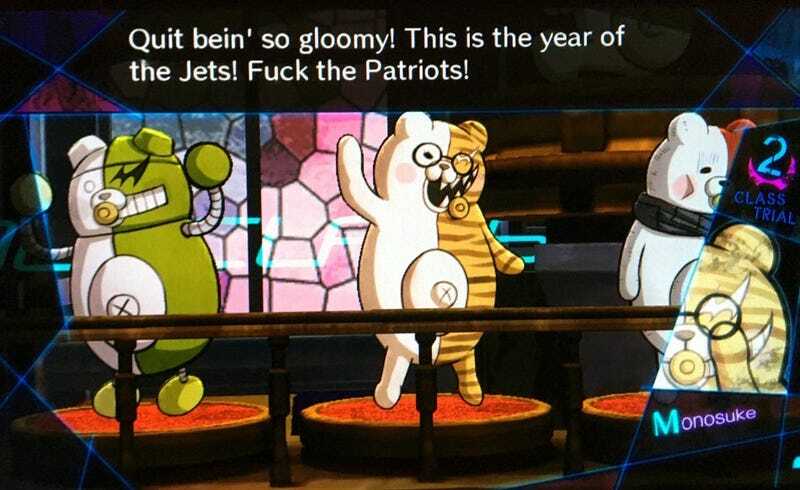 It made me wonder, though — did the Japanese writers of Danganronpa V3 really intend to make a joke about American football? I reached out to publisher NIS America for an answer. And that’s how an NFL joke makes its way into a Japanese game.